There are many signs that the Project Management Office is a growing trend for project management, despite the rise of collaborative, Agile and lean approaches to work. I have written before about the role PMOs can play in fostering collaboration, and for large projects, the PMO continues to have wide utility, even if they are becoming more decentralized and specialized. Each different type of PMO has a different focus, and it’s this focus that has to be determined before set up of a PMO can start. Successful PMOs, regardless of the purpose they are serving, all have one thing in common. They have the backing of a senior executive who will champion the set up and ongoing running of the PMO within the organization. With that in mind, the setup of a PMO relies heavily on ensuring the stakeholders – those people who will benefit from a PMO being in place – are consulted during the initial planning to ensure their objectives of a PMO are heard. Not every stakeholder’s request for specific functions or services the PMO will provide will be met; however for the PMO to be successful over time, the majority of requests should be planned for at some point in the PMO’s evolution. Most organizations start with a Project Management Office setup. This is mainly because they start using projects first as a way to deliver changes to their business. It’s only after a continued period of projects, which become increasingly more difficult, larger in number or more complex that program management and portfolio management makes an appearance. 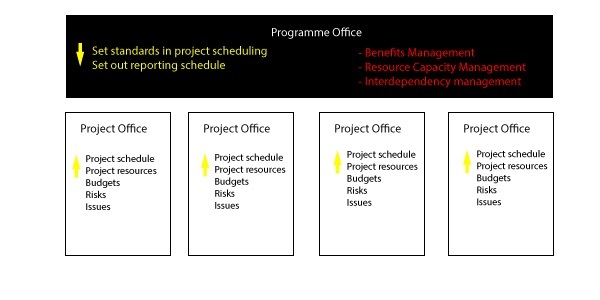 The aim of the Project Management Office is to support successful delivery of projects within the business. The two main stakeholders are the project managers the PMO will individually support and the senior management team, to whom the PMO will report on progress. The functions the PMO provides tend to cover the basics of project management, therefore it will support in areas such as planning, reporting, risk management, issues and resource management. Services would include maintaining the project schedule, updating the risk log, providing the weekly status report and so on. Setting up a Project Management Office for the first time means the functions and services it will provide have to be defined and agreed on by stakeholders. This work is carried out by the Project Office Manager before resource capacity in the PMO can be agreed and a wider PMO is brought on board. It is not uncommon to see a PMO with only one or two members of staff, carrying out a lower number of functions and services which the stakeholders deem to be the most important. The most common service area for a Project Management Office is reporting and is the area that most PMOs will focus on initially in a setup. The work of the PMO here focuses on a monthly timetable with data collected throughout the month before a consolidated view is, generally, given at the months end. The data includes time spent on projects by resources; costs incurred and spend forecasts; risks and exceptions; issues resolved and outstanding for the month ahead; and any other information requested by the stakeholders. The reports required really drive the work the PMO carries out over the month. To add, what some see as confusion around PMOs in general, is the Project Management Office can be a permanent OR a temporary structure. A temporary Project Management Office is one which is set up to support a large project and once that project has been completed, the Project Management Office will close too. The most common approach is to install a permanent Project Management Office. As an organization increases its project activity, the Center of Excellence model of PMO may come into existence too. This PMO is defined as creating and maintaining the standards of project management within the business. Here they will be responsible for the project management methods, processes, tools and standards to maintain and improve on successful delivery. In larger organizations this PMO will stand separately from a Project Management Office but work in parallel. A Center of Excellence will also be responsible for improving the capability of project managers and any other staff that actively manage projects. Areas of focus include defining the career path and development needs of project managers; identifying training needs and running workshops and sessions. As an organization’s project management maturity increases and larger change initiatives require a program structure to enable greater control, the Program Management Office is often created to support it. The PMO which supports programs is nearly always a temporary PMO, albeit some programs can last for years. The Program Management Office will take project management standards, tools and processes from the permanent Project Management Office/Center of Excellence yet their program focus means some services will change from those carried out by a project focused PMO. The Program Management Office is concerned with interdependency management as they look to provide reporting across all the projects with the program and provide a consolidated view for the Program Manager. They also focus on resource management across the program, specifically allocation and forecasting. Other program specific services include benefits management, consolidated work schedules and tranche reviews. To add to the complexity of a large program setup, each project within the program may also have a temporary Project Management Office in operation too. For the Program Management Office, this means they are directing how each Project Management Office reports and communicates to the Program Management Office. More recently the Portfolio Management Office has become the much talked about and desired PMO for organizations with a large and mature program and project management capability. This PMO is seen as the entity that can support and link the organization’s business strategy and the goals they want to achieve with the means and ways of reaching those goals through programs and projects. The services and functions that a Portfolio Management Office provides focus on ‘what programs and projects should be selected to achieve the strategy goals’. Functions carried out by the portfolio management office will include supporting the project prioritization process, supporting business case development and co-ordinating the project appraisals process. The Portfolio Management Office will also set the governance arrangements for an organization’s entire portfolio of program and project activity. At its simplest, the Portfolio Management Office is supporting the organization’s ability to select the right programs and projects to reach its strategic goals. The Program and Project Management Offices on the other hand are supporting the organization’s ability to deliver those programs and projects well. 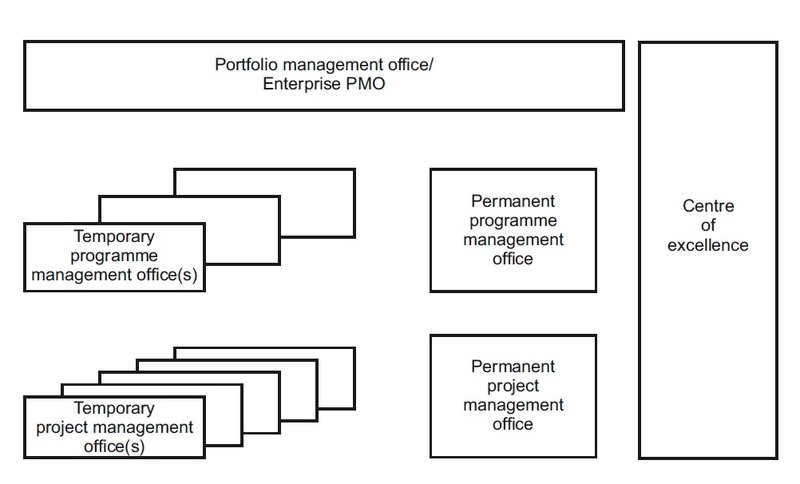 The full repertoire of PMO entities within an organization may seem vast, however having the full setup is not mandatory, it is determined by how an organization chooses to manage and control its projects and programs; how many programs and projects it has and the total number of people working within the organization on programs and projects. Successfully setting up a PMO for the first time relies heavily on two main factors. First, a clear understanding of what the PMO is there to support and therefore which type of PMO is required. Secondly, the setting up of the PMO must be backed by senior level sponsorship. Too many PMOs fail because this element is missing and PMOs become subject to cutbacks and closedowns. The setup, at any level, must include a clear checklist of the services and functions to be provided and requires a PMO Manager with specific experience in both setting up and managing an ongoing PMO operation. The balance of successful setup hangs between having the skills and capabilities within the PMO to be able to carry out the functions and services AND meeting the objectives that the PMO stakeholders have set. Setting up a PMO, like anything, requires support and effective tools to manage large scale projects with visibility at multiple layers of the organization. ProjectManager.com offers a robust suite of features with an online platform that provides easy collaboration while you plan, monitor and report on your project. Check it out free for 30 days. Is It Your Job to Make Your Team Happy?